Syria, the west’s response and international law, Letter, Wednesday 11th April 2018: “Readers including Mark Rylance, Brian Eno and Francesca Martinez respond to the escalating situation in Syria”. There can be no justification for chemical weapon attacks, or for despicable bombing that targets civilians of the sort that we saw in Douma. Further military intervention, as proposed by Trump, May or Macron, is not the solution and can only extend the appalling suffering of the people of Syria. It also risks spreading the war across the Middle East and raises the frightening possibility of direct confrontation between nuclear-armed powers. It is quite wrong to argue, as Tony Blair does, that these attacks are the price of non-intervention. Foreign military intervention from all sides, including from the UK government, has only served to deepen and prolong the war in Syria. Britain voted to join the US in bombing Syria in 2015 and was involved in covert operations before that. Its interventions have killed many people, fuelled the cycle of violence and done nothing to bring peace. Rather than backing the gung-ho foreign policy of the most inflammatory and xenophobic US president in history, the UK government should be seeking political and diplomatic solutions to the tragic situation in Syria, and to avoid anything that can escalate further the conflict in the region. 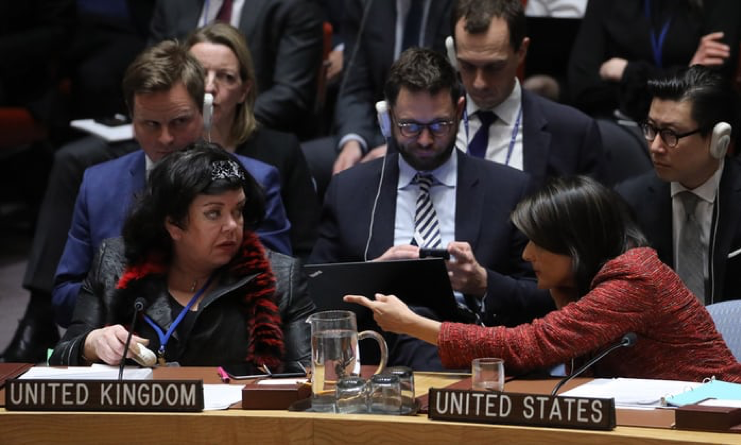 US ambassador to the UN and Karen Pierce, UK ambassador to the UN, during a security council meeting on 10 April 2018 on suspected chemical attacks in Douma, Syria.